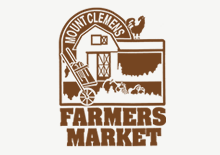 The Mount Clemens Farmers Market is an open air experience where shoppers can purchase the freshest, locally grown produce directly from area farmers. The Market is full of lively conversations where farmers and customers chat about the products, farms and sometimes even secret family recipes! Please…..NO PETS on the MARKET. Want to be a daily vendor on the market? Download application under the daily vendors tab located in the Members section.